One of the worst attrocities to take place in the modern world happened on September 11th 2001, when the World Trade Center in New York and the Pentagon in Washington DC were both attacked by commercial aircraft that were used, effectively, as flying bombs. As we all know, both towers of the World Trade Center were destroyed and the Pentagon was badly damaged, with great loss of life. These events might seem to have nothing whatsoever to do with the Chamber of Secrets that we are certain lies below the turf at the center of the Ellipse Park in Washington DC, but there is a connection. We were anxious to see whether that 'magical' spot at the centre of Ellipse Park showed connections with any locations and structures beyond Washington DC and we hit upon something remarkable. We need to take a line from the center of the Ellipse, north east, through Mt Vernon Square, where the Historical Society of Washington Building now stands. If we continue along that line, after a long journey we end up in New York, and what is more, this line runs right through the middle of Ground Zero, the area where the Twin Towers of the World Trade Center used to be. Of course this could be a random chance event, and indeed one would expect it to be, except for one important factor. The distance from the center of the Ellipse in Washington DC to the center of the Ground Zero site in New York is 366 Megalithic Yards X 1080. Maybe this doesn't look too impressive but it is. The distance between the Ellipse center and Ground Zero is 3 Megalithic degrees of arc of the polar circumference of the Earth! This measurement has the same relationship as all the others we have pointed out in Washington DC, it is divisible by units of 366 Megalithic Yards. Nor is there anything vague or approximate about this. Anyone can try it for themselves and they will discover that it is exact! There were four targets singled-out by the terrorists on September 11th 2001. Three of these targets were hit. The first and second were the two towers of the World Trade Center in New York, where both buildings were destroyed. 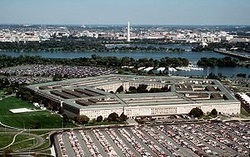 The third target was the Pentagon in Washington DC, which was badly damaged. The best guess as to what the fourth target was intended to be is the Capitol in Washington DC. (In fact this is not a guess because it has been reported that Al Qaeda representatives confirmed this fact under interrogation.) This target was not hit since the plane intended to crash into it went down in Pennsylvania, some distance from Washington DC. Assuming that the missed target was indeed the Capitol, there is a direct Megalithic connection between all the targets and the Chamber of Secrets at the center of the Ellipse. All are a distance from it that is divisible by units of 366 Megalithic Yards. And in the case of the World Trade Center the distance is exactly 3 Megalithic degrees of the Earth's circumference. We would suggest that this is far from being a coincidence. The targets chosen for September 11th 2001 all seem to have been considered because of their economic or political significance but there may be more to this situation than meets the eye. Later events, such as the siting of the WWII memorial, with its Megalithic significance, shows conclusively that an understanding of the positioning of significant structures in Washington DC is still understood by someone - and of course it has to be someone of great influence. Could it be that some of the Unites States' most implacable enemies are also in possession of the secret? When President Roosevelt completed the 32nd and 33rd degrees of Scottish Rite Freemasonry on the landscape of Washington DC, he was doing very much more than simply committing his country to a war. He was declaring that "from this moment on, America will take its place as the most powerful and influential state on earth - that it is committed to building the New Jerusalem that lies at the heart of all Freemasonic tradition and ideals." The actions of the bombers on 9/11 seem to have been specifically intended to destroy the 32nd and 33rd degrees in the most symbolic way possible - as well as saying in no uncertain terms "We Know!" Anyone who doubts this assertion needs also to consider the date on which the attacks took place. September 11th was by no means an arbitrary choice. Why? Because on that morning the Pentagon, as a project, was exactly 60 years of age! That's right, the first turf was cut on the Pentagon site on the morning of September 11th 1941. And this date is of course much more significant than the start of a building project. The moment the United States was committed to creating the Pentagon, it was carrying out the symbolic 32nd degree Freemasonic ceremony that would automatically also lead to the 33rd as the giant 33 Megalithic second triangle across Washington became a reality. This makes the attacks on that morning in 2001 all the more significant. We have now written a series of books together, starting with Civilization One. Although we never intended it to be that way, there is a common theme running throughout our books that has been winding-up for the last decade. Having discovered the Megalithic system of measurements, we then went on to realise that these also worked perfectly on the Moon and the Sun, as well as upon the Earth. This should not have been the case. This forced us to look at the Moon in greater detail, and although it sounds crazy in isolation, we eventually came to the only sensible conclusion. Earth's Moon was artificially and deliberately created in order to allow life to develop and flourish on the Earth. And what is even more important is that whoever or whatever created the Moon, left deliberate and unavoidable messages that this was the case. We defy anyone who has seriously looked at these 'messages' to dismiss them out of hand. In our book 'Who Built the Moon' we searched for possible culprits. Ultmately Chris and I have different opinions regarding what took place and who was responsible. My own answer will come in September of 2012, with the publication of my new book 'Intervention'. Our research continues. For example, we are now working on the possibility that further messages, and probably more information regarding our origins could be contained in redundant DNA and though this is looking promising, we are by no means narrowing our search for additional proofs of our true legacy as a species. It cannot be doubted that the events in Washington DC, both past and more recent, have alerted us all the more to the messages that exist all around us regarding the true origins of our planet and of humanity and it cannot be dismissed as a possibility that Washington DC itself is a deliberately created message. Everything points to the fact that something truly remarkable is about to happen to humanity and that it is coming quite soon. Will we soon get to understand the truth of our planet's past and of our own existance upon it? It seems eminently reasonable to think that this is the case. And that truth could so easily be housed in the deliberately created Chamber of Secrets below the center of Ellipse Park at the heart of Washington DC.